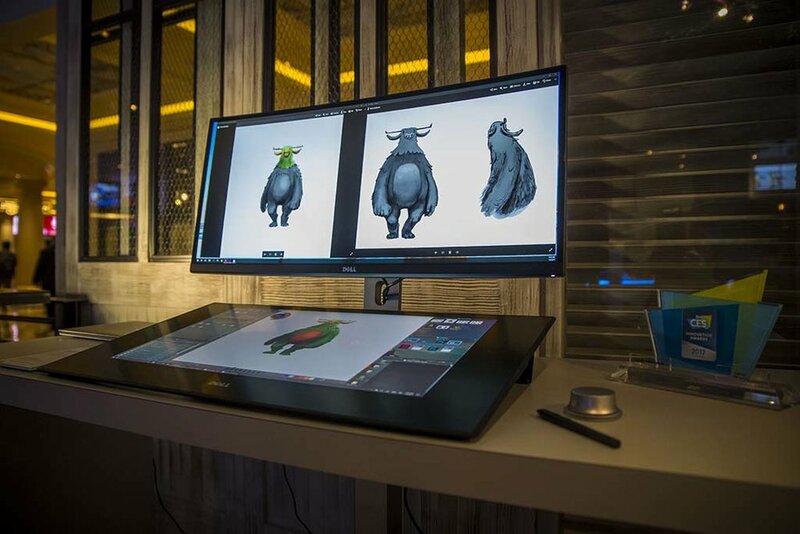 When images of Dell's smart desk concept leaked in November, it was assumed to be a Surface Studio-like all-in-one. But today's announcement at CES 2017 revealed that the product now known as the Dell Canvas is virtually identical to the Wacom Cintiq 27QHD Touch. Brian Eun, (@Shogmaster at TabletPCReviews.com forums) who is attending CES, had time to get up close and personal with the device earlier today and has confirmed that the 27-inch Dell Canvas pen display uses Wacom EMR technology and will ship with a Wacom driver. It's not known whether the driver will be the Feel driver found on other tablet PCs or the fuller-featured tablet driver found on Wacom's Cintiq products. According to the product specifications below, the Dell Canvas Pen will support 2048 pressure levels and tilt and feature two programmable buttons. The pen shown during the presentation does not appear to be a Wacom Pro Pen, but is closer to a typical low cost tablet PC pen. This may be the largest differentiator between the Canvas and the Cintiq. Eun brought along an Axiotron pen and confirmed that it worked (with no tilt in Photoshop). 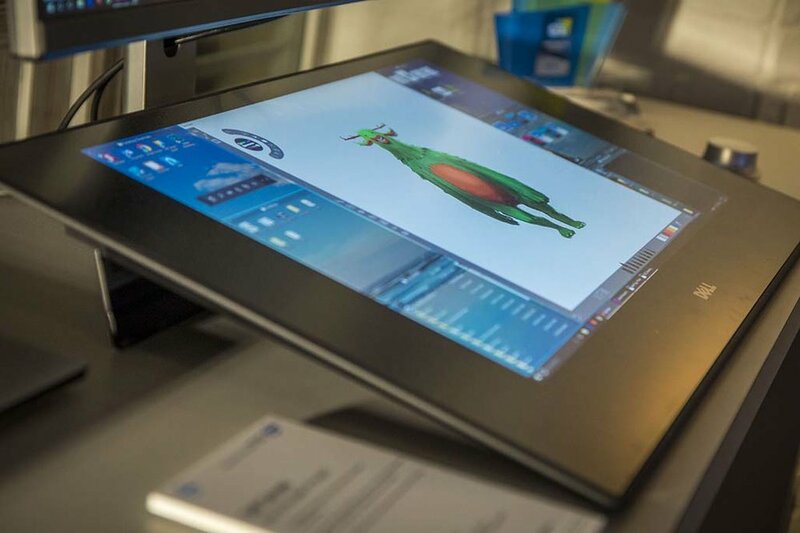 The Dell Canvas displays a color gamut of 100% Adobe RGB vs. 95% for the Cintiq. Another major improvement is the touch 20 point touch panel, which means the display could accept input from more than one user at once. The Canvas also has Surface Dial-like wheel accessories the company calls Totems. These are not battery powered according to Eun and do not require Bluetooth pairing. Each totem uses four touch points for location and a button for actuation. This means that it may be possible to use more than one totem at a time. The Dell Canvas will be available for purchase in March, with shipments beginning in April, 2017, coinciding with the Windows 10 Creators Update. The price has been confirmed at $1799. What do you think? Can the Dell Canvas dethrone the Wacom Cintiq? Does it quench some of your Surface Studio envy? Leave a comment below. An entirely new innovation in interactive design and digital content creation. Revolutionize the way you work and create with a 27” QHD, horizontal “do” surface that encourages interaction through touch, a highly precise pen, and totems – all while working seamlessly with your professional software and monitor setup. Welcome to your new workspace. Display and input merge into one device, streamlining your interactions with system and content. Placed in a natural, horizontal location that encourages touch interaction, create and edit your work in stunning detail with the expansive 27” QHD Adobe RGB display. Purpose-built with direct bonded, anti-glare Corning® Gorilla® Glass for enhanced durability, experience your content in stunning detail, like never before. The familiar touch of your own fingertips and the ability to collaborate with colleagues – with 20 points of touch recognition, Dell Canvas 27 allows you to work in a familiar way. A highly-precise pen for sketching and creating, and support for dual-handed productivity, ensures that creating feels natural. Physical objects that fit comfortably in your hand, referred to as totems, come standard, further enabling ease of use and productivity. Intuitive new features, included withWindows® 10, and optimizations included in your high-powered software, enable a dynamic new experience. By combining an interactive touch screen with innovation in user experience and participation from key Independent Software Vendor (ISV) partners, Canvas 27 will change creative, design, and analysis workflows for the better while introducing a new, immersive way for professionals to interact with those demanding workflows. Totems Included Yes, solid cap style with integrated button, and dial.